Kuizenga–Siegman theory can be applied only to simple cases. 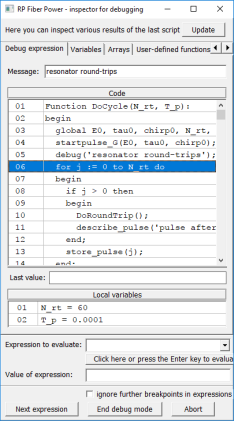 More generally, pulse durations can be obtained from numerical simulations with the software RP Fiber Power. The modulator causes a slight attenuation of the wings of the pulse, effectively reducing the pulse duration. Due to its limited gain bandwidth, the gain medium tends to reduce the bandwidth of the pulse and thus to increase the pulse duration. Note that for decreasing pulse duration the pulse-shortening effect of the modulator becomes less effective, whereas the pulse-broadening effect of the gain medium becomes more effective. For a certain pulse duration, both effects are in a balance, and this determines the steady-state pulse duration (see Figure 1). 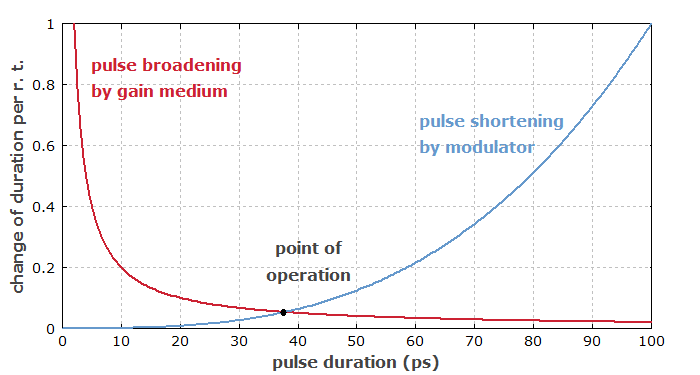 Figure 1: Blue curve: decrease in pulse duration per round-trip caused by the modulator. Red curve: increase in pulse duration caused by the gain medium. At the black point, both effects are in balance. where g is the intensity gain, M is the modulation strength, fm is the modulator frequency (which is assumed to match the round-trip frequency), and Δνg is the FWHM gain bandwidth. This equation is subject to a number of assumptions (which will not be discussed in detail here), but generalizations for other situations are possible. This result shows that e.g. driving the modulator more strongly will hardly decrease the pulse duration. For shorter pulses, passive mode locking is much more effective. In that case, the blue curve in Figure 1 can be replaced with a steep straight line for the saturable absorber, which shifts the intersection point far to the left.